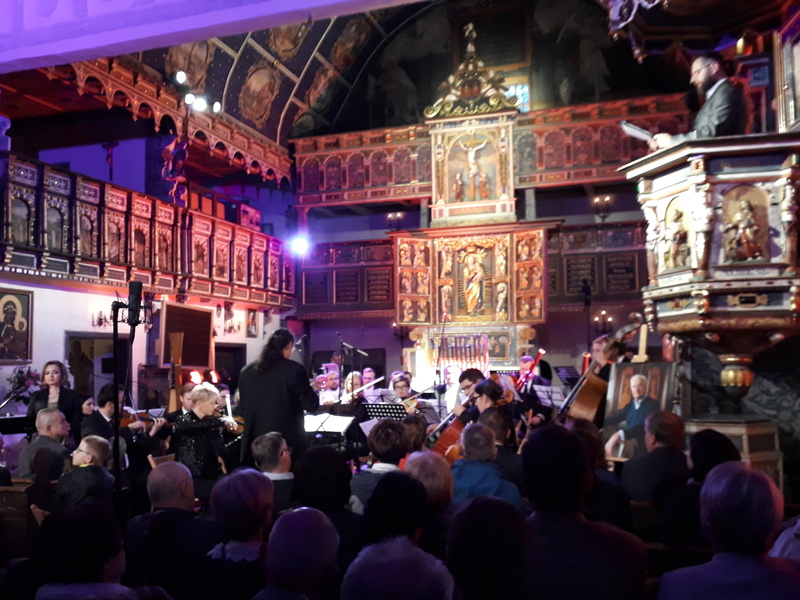 The Symphony of Freeedom composed to celebrate the centennial of Polish Freeedom (1918-2018) by Jakub Kotowski, lyrics by Ewa Lukas-Janowska was performed in Klepsk church by the professional musicians. The music refers to Psalm 150 in which people are encouraged to praise the Lord on various musical instruments used also in the symphony. Also the aneglic orchestra is painted on of the ceilings inside the church (very close to the Australian chamber). This was an unforgetable event and hopefully not the last one when our wooden treasure is used also as the art stage and place of joy and happiness. The second performance took place on Thursday (Sep 27th, 2018) in Zielona Gora (Church of the Holy Saviour). 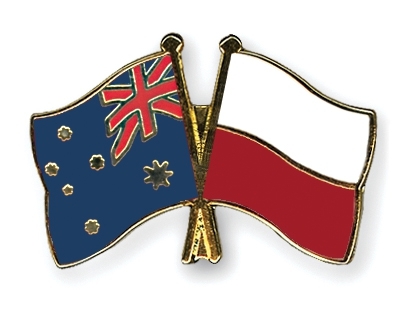 Jim and Pam McKenzie from Adelaide paid us a visit in search of their roots in Poland. They are the descendants of the families Hentschke, Arlt (Przytok and Jany), Koch (Rakow and Rosin) and Neldner (Rakoniewice and Pruszkowo). They spent two days in our region, also they visited the church in Klepsk and Cigacice harbour. They also were present in Rakoniewice where they saw a wooden house of the pastor and the former Lutheran church (nowadays a museum of the firemen) and a small village of Pruszkowo where they found the grounds of the former protestant cemetry. 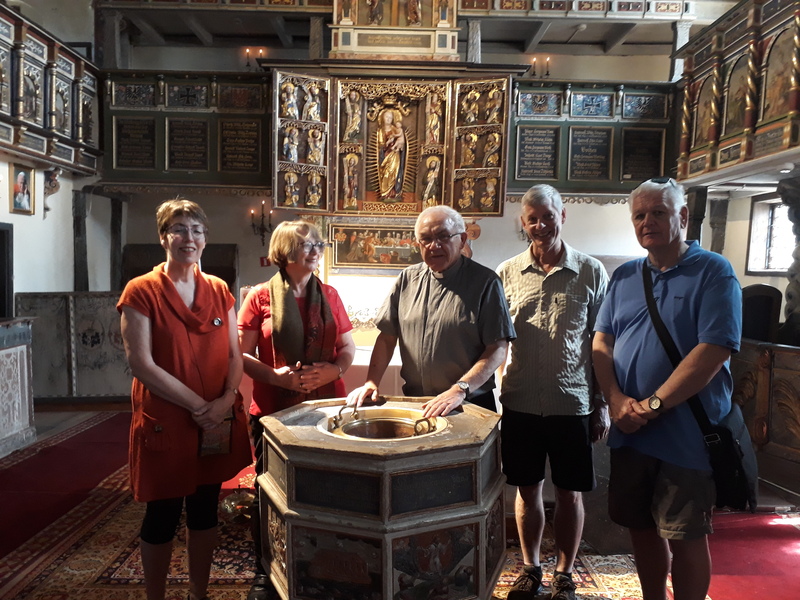 This was an extraordinary visit, as the couple: Malcolm and Jullie came from New Zealand to visit Klepsk, Jany, Przytok, Kije (Kay) and Ostrzyce. 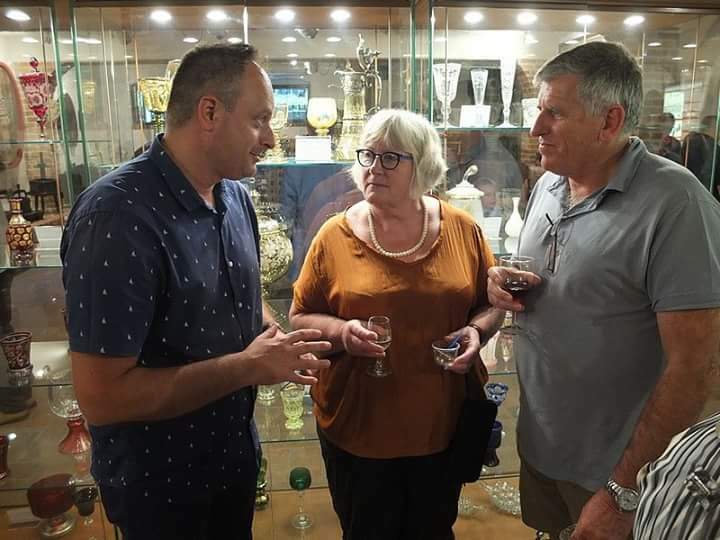 They met with Father Banas, visited Cigacice harbour, strolled about Zelona Gora including its Lubuskie Regional Museum where they took part in the opening of the new exhibition in our Wine Museum. They also saw Swiebodzin (statue of Jesus Christ) and climbed to the tower of te castle of St. John's Order in Lagow which encharmed them. However, the biggest treasure on the route, they say, was the wooden church in Klepsk. 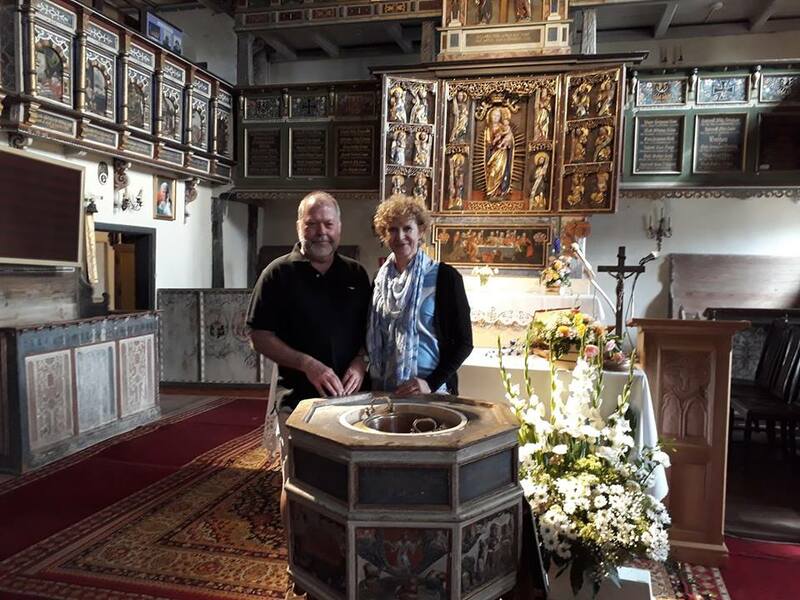 Sally Pfeifer from Adelaide (however a born Canberra citizen) visited our region in search of the family roots here in Lubuskie. First we were in Stargard Gubinski, then Zary (counties close to Polish-German border, more to south west) but we finished in Klepsk and Okunin, where most of her ancestors came from. Sally visited the parish house in Legowo and met with Father Banas, too, where she found out that she might be related with another Australians who had recently visited Klepsk. It was like a real match making experience. She also found her family's photo in the Schillings' Book dnated by Frank Ingvarson. Finally, Sally visited Cigacice - the Odra river harbour and of course Zielona Gora. Family Schulz from Adelaide (WA) paid a one day visit to Klepsk, Nowy Klepsk, Karczyn and Ostrzyce (families Reibke, Fischer). 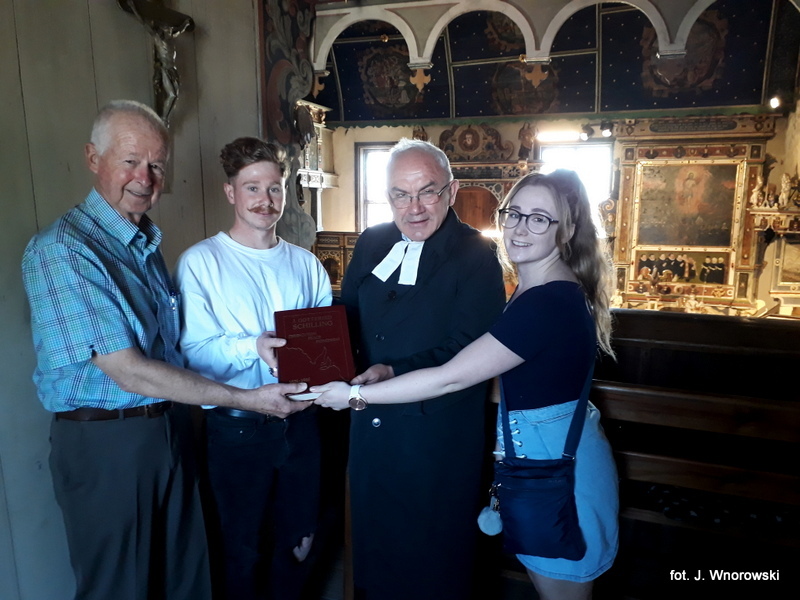 They met with Father Banas and Jaroslaw Wnorowski (their local guide), then went to Swiebodzin to see the tallest Christ statue in the world (36 m.) and had wine tasting in Winnica Cantina (Vineyard) in Mozow near Sulechow. Finally they saw the harbour in Cigacice. It was a fruitfull visit, as they concluded. Father Banas received, as a gift, a magnet with the portrait of Mary MacKillop, Australian first catholic saint. Four memebers of the successors of the Schilling family (3 seen on the photo) visited the church in Klepsk. The oldest of them (but the youngest by heart feeling) - Frank Ingvarson from Perth, is the 5th generation of the Schillings. He was accompanied by his grandchildren (7th generation). 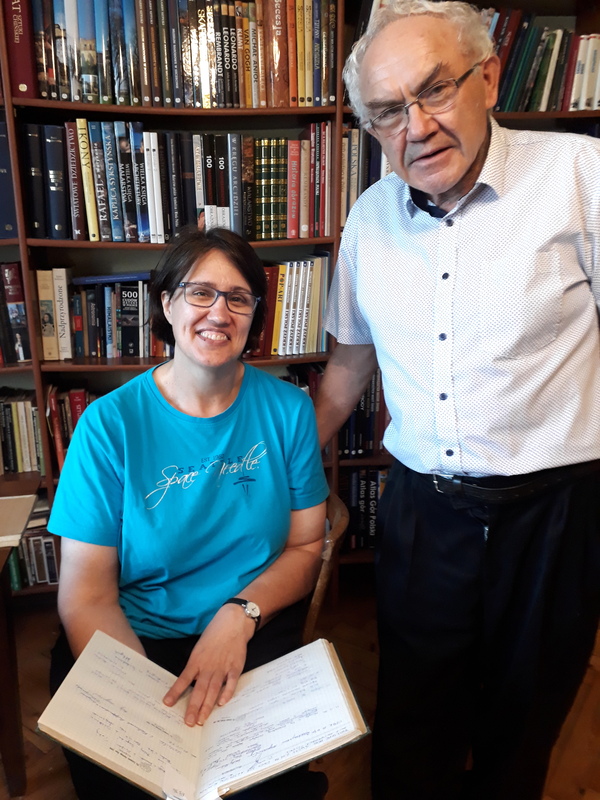 During the visit, in presence of Father Olgierd BANAS (catholic priest seen on the photo in Lutheran lithurgical vestments), Frank gave a book "J. Gottfried Schiling - Persecution, Peace, PIoneering 1838-1988" as a gift to the Australian chamber inside the church (1st floor). Then the whole delegation with Jaroslaw Wnorowski (author of the website and certified tourist guide) went to Okunin (formerly Langmeil) where their ancestors worked and lived. In the end, they also visited Cigacice (Tschecherzig) harbour where the journey by water began. The official presentation of the book to the members of the parish took place during a high mass on Sunday, July 8th, 2018. The Pesident of Poland - Mr Andrzej Duda, signed an act which made the wooden church in Klepsk even more famous and important. Since March 2017, the church is added to the prestigious list of the most precious objects of history of Poland (called List of Monuments of History). Only 3 such objects (incluidng the new one in Klepsk) are on the list in LUBUSKIE region. The tittle means more funds for conservation and better promotion. On May 6th, 2017 Fr. Banas (the main priest of the parish) annunced the good news officially to the public and thanked all those involved into the sucess, including the author of this website :). 20-XII-2015 - Klemzig (Klepsk) church gained two bottles of wine from Langmeil Winery for its chamber of remembrance. The wines were donated and sent thanks to Josephine Monk, Winifred Hansen - descendants of Christian Auricht (blacksmith from Chlastawe - nowadyas Chlastawa) and Jonathan Bitter from the vineyard. 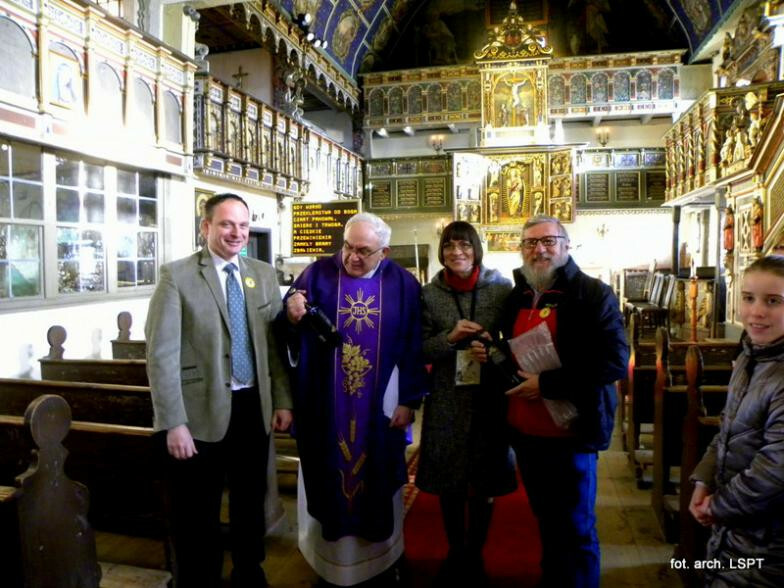 Priest Olgierd Banas was delighted and very happy with such a gift for the local community and for the church. He presented the bottles in the end of the Sunday mass, so that everyone from the village could see and touch the gifts. Those are two kinds of wines: Freedom (Shiraz) and Blacksmith (Cabernet Sauvignon). They will remain unopened in Klemzig's church for ever. On the picture: From the left: Jaroslaw Wnorowski, Fr. Olgierd Banas, A. Palicka with daughter (first from the right) and I. Gorzelanny in Klepsk church. 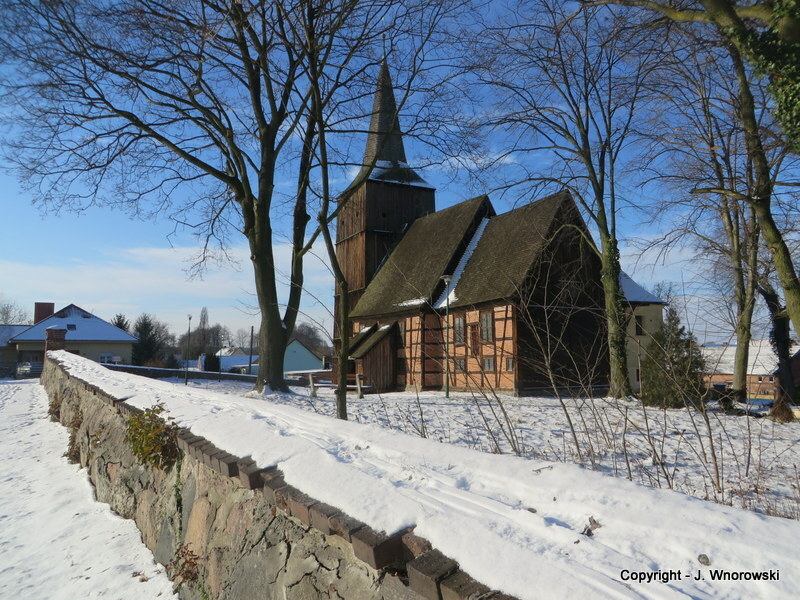 12-VIII-2016 Klepsk parish church together with other wooden churches in the neighbouhood (Kosieczyn and Chlastawa) have been nominated in the Polish competition "7 new touristic wonders". The competition is organized to promote interestng places around Poland, especially those with rich history but sometimes hidden somewhere and almost forgotten.